Well everyone, here is is, the first article about our honeymoon. I figure I ought to start by telling you that our wedding was great. It was wonderful to have so many friends and family all gathered around us to celebrate our marriage, and I’m incredibly grateful to everyone who attended, everyone who wished they could, and everyone who helped in some way. I’m glad to have gotten married, but by the time we hit the road leaving Sioux Falls, I was ready to not be the center of anyone’s attention for awhile. I’m not much for the spotlight and weddings are stressful, even when they go well. Once we hit the road, it didn’t take me long to relax. It didn’t hurt that we had perfect driving weather; warm temperatures, a slight breeze, and a sunny sky. We were a little exhausted from the day before, but overall in good spirits. We had good road trip playlists rolling in the car, and we settled into that good time that you have when you’re on the road with someone you like spending time with. Even the view from the rest area at Chamberlain was gorgeous. Our plan was to drive through the Badlands National Park, but a few hours in and we needed to stop again. I’m well-known throughout my friend circle as having a child-sized bladder, so I was glad when we happened upon the Minutemen Missile National Historic Site visitors center. The site is relatively new, managed by the National Park Service. The facility looks fantastic- clean, well designed, and nicely constructed. The place just isn’t really finished yet. The building is in place, but none of the exhibits are. Temporary exhibits, full size mockups, and design schematics were hung on the walls; it’s not perfect, but it’s a nice proxy for the time being. It isn’t as polished as you’d like to see, but the information and imagery is present, and the museum studies part of my brain respects the notion that some people will have a better understanding of what goes into preparing an exhibit now. I don’t know what timetable they’re looking at for completion at the site, but from what I observed the design is finalized, so I would guess it’s all about fabrication and installation now. Everything from the NPS seems to indicate that it should see completion fairly soon, so you may get to see the permanent exhibits in the near future. There is a ten minute introductry film titled, “Partners for Peace,” that shoes in the visitors center. We didn’t stick around to check it out, but if you like Cold War or military history, I recommend the site. If you’re really interested you can check out a Minuteman II missile in its silo at Delta-09 or take a tour of the Launch Control Facility, Delta-01. We didn’t check either of those out, but if you’d like to be advised that the schedule changes seasonally. For more details, go to http://www.nps.gov/mimi/index.htm. Moving onward from the Minutemen Missile Historic Site, we made our way to the Badlands National Park. The Badlands are, to put it bluntly, pretty bizarre. At least for a guy born and raised in central Illinois. One minute we’re driving along rolling prairies, which are familiar enough. I’m from the midwest, so I know prairie (albeit significantly less rolling where I’m from). Then, next thing you know, this very alien landscape appears. It’s strange and hostile and… Just incredibly beautiful. So what exactly are the Badlands? Well, the Badlands National Park protects 242,756 acres. 64,144 acres of which are designated wilderness area. The terrain is pretty unforgiving, formed by deposition and erosion, leaving sharply eroded features like buttes, spires, pinnacles, steep slopes, ravines, mesas, and hoodoos. The top layer of soil is a loose crumbly gravel-like composition that makes it hard to keep your footing anywhere the ground isn’t even. It’s simultaneously intimidating and awe-inspiring. We took the Badlands Loop Road through the Park. This is a roughly 40 mile long road which is at times steep and winding, but easily traversed. There are several stops along the drive. Scenic overlooks. Some have trails, which we explored a little bit. My natural inclination was to follow them as far as I could, but we were pretty exhausted. We ventured out a ways onto the Castle Trail, and it blew my mind a bit. Walking out among the formations really is like being in another world; a very hot world at that. My sweat soaked into my Batman t-shirt, and though it felt good when the breeze hit me, I know how quickly a damp cotton shirt can become uncomfortable (and dangerous depending on conditions). Luckily, at the top of my pack, I had stashed the synthetic athletic shirt I had received for running the Bix a few months back. It was a welcome change that aleviated a lot of the heat. Let that serve as a reminder everyone, cotton is NOT a good cloth in which to go exploring. It soaks up moisture, takes forever to dry, and insulates poorly while wet. As odd as it is to think about, even though it was hot enough in the sun for me to sweat through my shirt, if I hadn’t changed and we had gotten in the shade or the wind had picked up speed, I’d have been at risk of hypothermia. Luckily, I knew better, so off came the cotton shirt. Farther along we came upon the Saddle Pass trailhead. Saddle Pass is only a quarter of a mile, that leads to a lovely peak and meets up with the Castle Trail. Or so I’m told; we didn’t take the trail. Despite being only a quarter mile long, it’s a rough hike. A nearby gentleman told us that it took him over an hour, and he looked pretty fatigued. He said the view was worth the climb, but that he wouldn’t do it again. We set off up the steep incline, contemplating how far we might follow the trail. The crumbling terrain, blazing sun, high temperature, and the fatigue of twelve hours of standing in dress shoes the previous day made me rethink the approach. After reaching a spot where we could step off onto a plateau and reassess the increasingly steep incline that wound upward and out of sight, we made the decision to bail out. It’s always disappointing when you have to make that call, but I wasn’t prepared to make that hike that day. The terrain was completely foreign to me, and we decided that it was more important that we be well rested (and uninjured) for our hike up Harney Peak the following day (which I’ll tell you about in the next Honeymoon post). As much as I wanted to scramble up that trail we made the right call; we reminded ourselves that we can go back and storm up that path another time. It’s important to keep the ego in check with these things. On most days we could have hiked up with no problems, and it stung my pride a little bit to back down from such a short hike, but after almost losing my footing and just about eating trail a few times, I knew it was the right call. The day after our wedding just wasn’t a good day for it. Tired and hungry, we walked back down the path to the clearing and then the Kia. I don’t mind pushing myself and I don’t mind taking risks, but sometimes when you’re not prepared for what you’re facing, it’s just better to walk away. It isn’t easy, but it’s usually the right call. This is the gentlest grade we encountered on Saddle Pass. After this is gets increasingly aggressive. If you’re going to hike the Badlands, wear the right clothing, proper footwear, and take plenty of water, because there isn’t a source of potable water out there. The environment is harsh; you’ll be hot in the sun, but you might find it cold in the shade. It’s not easy to keep your footing in some places, and there is the possibility of running into a rattlesnake or two. Don’t try to take a difficult trail in your flip flops, like one guy we saw. It won’t be comfortable, and you’ll be risking an injury. And you probably don’t want to dance with a rattlesnake while you’re in flip flops either. My disappointment at not ascending Saddle Pass didn’t last long. As we drove through the park we came upon a group of Rocky Mountain Bighorned Sheep. There are some arguments about these sheep; they’re not actually native, but have filled a void in the region left after the extinction of the Badlands Bighorn in the early 1900s or 1920s, depending on who you ask. There is some debate now, however, as to whether the Badlands Bighorn was actually a distinct species, with some studies indicating that they were actually a variation of the Rocky Mountain Bighorn. I’m not well-versed enough to have an informed opinion on that debate, but I can tell you it’s incredible to be so close to these animals. They seem docile, like you could reach out and pet them, like the sheep at the historic farm where I used to work. Don’t do that though; they only seem docile. Rams can do serous damage when they want to, and the ewes aren’t pushovers either, so I had no intention of provoking them. These are the ewes (females). You can see that they’re tagged around the neck, or they have some sweet necklaces. The National Park Service suggests that if the animals react to you then you’re too close, but when the animals are walking along the road, it’s hard to keep your distance. Still, it’s important to remember that while these animals may have grown accustomed to human presence, they are still wild animals, and this is not a zoo. We’re encroaching on their habitat, and they’re not pets. This fella is the ram, though still a young one by the look of him. The horns are lovely. Sorry for the poor photo quality! But my god they are magnificent. Don’t let my warning about them being wild scare you away; be cautious, but definitely go observe them. Seeing the strength and beauty of a wild animal up close and personal will fill you with awe. Luckily, these bighorns wouldn’t be the last of the animals we’d see that week on our journey. They wouldn’t even be the last we’d see on that drive; there were prairie dogs everywhere alongside some stretches of the road. We may not think of them as quite so magnificent, but they are highly social animals that live in neighborhood-like colonies and create specialized rooms in their burrows. They don’t seem impressive at first glance, but their territorial and familial hierarchies and structures are noteworthy. Over twenty families can live in one prairie dog “community,” and the rodents will warn the entire community with a special call if predators are spotted. They even differentiate between different kinds of predators, eliciting different responses depending on the threat. So while they don’t seem majestic at first, and may be regarded as a nuisance by some, they are impressive in their own right. A little farther down the way, it was time to take (yet another) yoga photo for Clarissa. I often joke that being her unofficial photographer is now just part of my life. Most of the time I don’t mind, and this was one of those times. As we walked out beyond the overlook and onto the landscape, she posed and I snapped her photo, then she stared out into the distance. It’s easy to get caught up in the scenery there. So I walked out and joined her. Before I walked out and joined her, obviously. We stood for a moment watching the sun sunk lower in the sky, and I started to acclimate to the area a bit more now that we were along in the landscape. Before, surrounded by people, it was more difficult for me to really immerse myself into this bizarre world, but at that moment, in the quiet, my mind settled, and I finally became attuned to my surroundings and their inhabitants. I knelt down, and took in the sound of the wind in my ears, the feel of the setting sun on my face, the crunch of the strange popcorn like soil underneath my feet. It was at this point that I noticed, only a meter away across the tiniest ravine, a couple of small rabbits. I am typically better at noticing the sights, sounds, and signs of wildlife than Clarissa is; to be fair, I’ve had a lot more practice at it. Still, she patiently accepts me stopping her in her tracks or interrupting her with an inquisitive look on my face before I point out a glimpse of an animal or a sign of its passing. Being so close to the little guys, I quietly stood and got her attention ever so subtly, and directed her gaze to the animals. We took out phones and cameras to try to take a few shots, and did manage to get a few photos before we scared the hell out of the little critters, sending them scurrying back and forth a few times before they exchanged places and froze once more. We figured we had given them enough shock for one day and retraced our steps back to the car. As the sun sank lower and lower we started to realize just how worn out we were. There were a few more overlooks that we wanted to see, but we also desperately wanted (dare I say, needed) to get some substantial food in our stomachs. So we decided to bypass the last few spots we wanted to stop, and hit them on our way back through. So we hit the road for Rapid City SD where we would be staying for the next few days. The Alex Johnson is a historic, supposedly haunted, hotel. We experienced no ghostly phenomenon, but did have a few troubles with the shower. We’re not too picky when we’re traveling though. My father was always apt to point out that a hotel is really just for showering and sleeping, and that holds true for Clarissa and I; we’re not hang out in the room kind of people. Our goal was to spend as much time outside as possible, so even though the room wasn’t perfect, it was more than serviceable, and we had few real complaints. After a burger and a beer at the nearby Firehouse Brewing Company (both the burger and the beer were delicious, by the way), we walked back to our room and literally passed out. Our trip was off to a great start. The next day would find us better rested and on our way up a mountain, but I’ll get to that in the next honeymoon post. 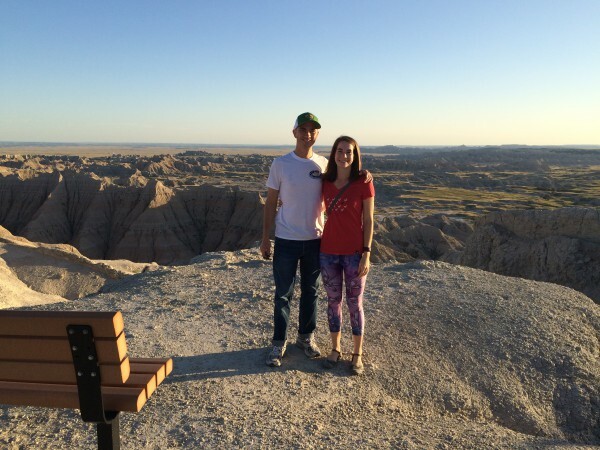 If you’re asking yourself if you should go to the Badlands, the answer is an unequivocal YES. It’s an amazing place and worth exploring. You need to respect how dangerous it can be; sadly, the remains of a lost hiker from Nebraska were found the week after our return to the Quad Cities, and my heart goes out to his loved ones. Make no mistake, the Badlands can be dangerous. The park is very accessible, but you still need to exercise caution. Treat the Park with proper respect and don’t go beyond your experience level. Be prepared for whatever activities you’re engaging in, and don’t hesitate to bail out on something if you’re not comfortable. I want you to have a great time, but I also want you to make it home safe. If you’re not sure what your capabilities are, you can just do the Badlands Loop Road, like we did. If you’re a bit more adventurous and have some experience, then you can hike a little on designated trails, of which we did only a small bit. If you’re very experienced, there is some cross-country hiking, of which we did not partake but I would love to in the future. There is camping in the park in designated areas, and the very nice Ben Reifel Visitor Center with some great permanent exhibits and a fossil lab that is open to the public at specific times. The Badlands National Park offers something for all skill levels and types of tourists, so don’t be frightened off by the hostile landscape. Just be cognizant of your skill level, plan accordingly, learn and respect the risks, and enjoy one of America’s National Parks. There are more animals in the Badlands than what we witnessed. There are bison, antelope, coyote, and deer as well, and if you’re patient you may have an opportunity to see some of them. Make sure to keep an eye on the weather if you plan on doing any hiking, and be sure that you take plenty of water along with you. It’s better to have it and not need it than need it and not have it. Don’t forget to stop in at the Ben Reifel Visitor Center, where park staff will be able to assist you in learning more about the park, as well as direct you to the Cedar Pass campground and the nearby amphitheater. For more information, go to http://www.nps.gov/badl/index.htm and take a look around. There will be plenty there to get you started planning your own trip. I hope you’re enjoying reading about our intrepid honeymoon. Keep checking back for the next installment when I’ll tell you about our hike up Harney Peak. If you want to make sure you don’t miss out on anything, be sure to follow Intrepid Daily so you can know whenever a new post drops. Have you been out around the Badlands and Black Hills? If so, please share your experiences with me in the comments, I’d love to hear about them. Until next time, stay intrepid. Later installments of the honeymoon series can be found here. It looks like you’ve had a great start to your honeymoon! The Badlands are amazing. I’ve never been there but now I really want to. As you’ve said, it’s such an alien landscape. I also find I connect much better to a place when not surrounded by many people. The area becomes more intimate then and you can really soak it up. Are you planning on going back and hike more of the Badlands? Thanks Allysse, the trip was fantastic. The Badlands really got under my skin (in a good way) because the landscape and terrain is so alien to me. It took me a good long while to really center myself while we were there, and I still was in a state of amazement with the Park when we drove back through on our return trip (which I will also write about eventually)… I definitely want to go back and do some camping and hiking. I’m told that there is very little light pollution in the area, so the view of the night sky is incredible. I really want to find out about that first hand. As of right now we don’t have any definitive plans for a return trip, but I think it’s pretty certain that I’ll get a new pair of boots dirty in the Badlands eventually. Nice job, Wade! I am going to SD in 2 weeks to partake in an adventure similar to your (minus the honeymoon part). Nonetheless, I am super stoked and your posts have been very helpful. Congrats on your recent ceremony, you both seem very happy! Can’t wait for more posts! I’m so glad that you’ve enjoyed my posts and found them helpful Emily! That’s the whole point of what I’m doing, so your compliment brings a smile to my face. Where all will you be going while you’re in SD? You’ll probably be on your way before I can get all of the Honeymoon posts written, but I’d be happy to message you and tell you about some of the other stuff we checked out if you’re interested. I hope you’ll share some of your trip with me when you get back as well! Thanks for the congrats, and I hope you enjoy the upcoming posts as much as those you’ve already read. We will be going to through the Badlands, Mount Rushmore, Keystone, etc. We are staying in Hill City. I am open to any suggestions you have! In fact, that would be great! Enjoy your trip to SD! We had an awesome time! Plan more time for the Badlands than you think, I always end up wishing I had more time to explore there. Wade will have some helpful posts for sure, but Harney Peak is a must if you like hiking and have the time it’s also right by Lake Sylvan which is gorgeous! 🙂 ENJOY! I love adventures and this looks like a great start to one! I’ve never really looked up the Bedlands but now I know I have to check them out at some point. Thanks for sharing such beautiful pictures!